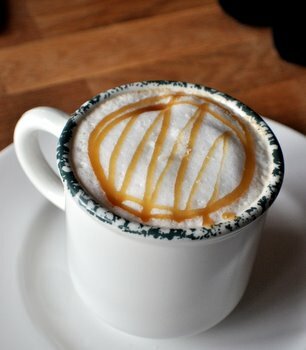 Salted caramel is exactly what it sounds like: caramel that has had additional salt added to it. This is done to cut the sweetness of the caramel, which is primarily made of sugar, and to make it even more addictive by introducing a savory note that makes your mouth water with each bite. 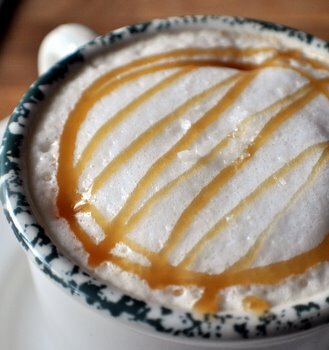 Salted caramel shows up in all kinds of places, but most recently has been appearing in coffee shops as an addition to drinks. You can come by salted caramel sauce in two ways: make it or buy it. Store-bought salted caramel sauces, such as Trader Joe’s Fleur de Sel Caramel Sauce are not that common, but they are becoming more widely available. Stir some into any cup of coffee for an instant salted caramel fix. The other option is to make your own caramel sauce (or buy plain) and add a big pinch of coarse salt to it. I recommend coarse salt, such as kosher salt or sea salt, because it stands out against the carame and doesn’t dissolve into the drink immediately, giving you salted caramel in coffee – not just salty coffee. This Salted Caramel Mocha is a regular mocha – made with espresso, cocoa powder, sugar and milk – with some caramel swirled into it. I drizzled some more on top and that is where I put in my big pinch of coarse salt. Adjust the sweetness to taste when you try this at home. In a large mug, whisk together espresso, cocoa powder, sugar and caramel sauce until all of the sugar has dissolved. Top with steamed milk. Drizzle milk foam generously with caramel sauce and add a big pinch (maybe 1/8-tsp per cup) to the top of that caramel sauce. *Note: you can do this with half coffee and half milk if you don’t want to use espresso or don’t have steamed milk.